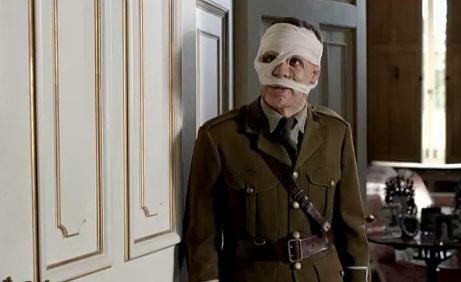 A mysterious burned officer comes to Downton. What’s with the mysterious P. Gordon’s Canadian accent? This week we were battered about the head by considerations of legitimacy: how much easier life is when a child’s paternity is acknowledged, the challenges of establishing one’s true identity, what it takes to be a “proper” heir, and the differences between men who inherit great houses and those who buy them. I’m as confused as Lord Grantham about how to respond to the sudden appearance of P. Gordon. I long to open my heart to the poor guy just like sweet, trusting, farmer-snogging Lady Edith did. If he really is Patrick Crawley, back from the dead like Lazarus, then the other family members have treated him appallingly. The unfortunate fellow left behind Montreal’s delicious smoked-meat sandwiches and crossed the ocean to serve king and country. He fought at Passchendaele and seems to have lost a hand and much of his face—and all he gets for his trouble is to be treated with suspicion and froideur? Would losing one’s face really be enough to make a person completely unrecognizable? Would hair, voice, and other physical characteristics offer no clues? I was thrown by “Patrick’s” accent. Four or so years in Montreal and a couple of years with a Canadian light infantry regiment surely wouldn’t erase an English accent completely. Lady Cora has been in Britain for at least 20 years, and her American accent is still strong. But Peter Gordon was in Montreal for only three or four years himself, so he would be even less likely to talk like a Canuck. Matthew is right that “sacrifice should be rewarded,” but perhaps handing over the house and estate to an unstable stranger is taking things too far. By the way, boys, I bet you blanched at my mention of “Lady Cora” in that previous paragraph. As some commentators and at least one exasperated email correspondent has pointed out, that’s not the right way to address the former Cora Levinson. As the wife of an earl, she’s rightly Cora, Countess of Grantham, or Lady Grantham. But dear Cora is so not a “Lady Grantham”—and not only because she was born in Cincinnati. Am I crazy to think that she’s been called Lady Cora on the show? She certainly has in the British press (even by aristo-loving papers). Perhaps it’s because I had to spend precious moments of my childhood learning the correct way to address an earl that I rebel against titles—I’m an American now, and it’s my Constitution-given right to mangle that nonsense. What did you two make of that scorching scene between Sir Richard Carlisle and Lady Mary? Twice he stood with her parents staring through windows as Mary and Matthew spent time together outside, and both times he wondered aloud if he should be jealous of their relationship. (He even joshed about Carson being a rival for Mary’s affections. The butler treated that suggestion with the contempt it deserved.) I loved the question Richard asked her mother: “Is she as convinced as he is that they have no future?” He’s obviously one of those newspaper proprietors who would’ve made a good journalist. But the grip he had on her wrists before the Armistice celebration when he reminded her that he has the power to destroy her should she ever cross him was quite chilling. How lucky it is for Matthew and all the other convalescing officers with mobility issues that Downton Abbey is completely wheelchair accessible—right down to the sprawling grounds! I know the show can’t deal with every issue, but I can’t help craving a bit of realism on that score.